This comes on the back of a 34% rise in national dwelling values over this growth cycle. While this is hardly a “crash”, national dwelling values haven’t fallen this much over a single year since February 2012. 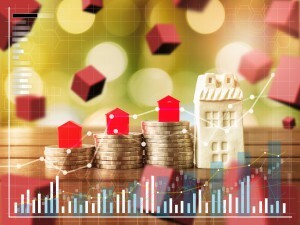 According to the latest stats from Corelogic while the weakest conditions continue to be felt in Sydney and Melbourne where investors have been the most concentrated and where housing affordability is the most stretched, the housing slowdown has become more broad based over the last few months – a sign of tighter credit availability. But of course there are many submarkets around Australia, with some performing much better than others. In fact many areas are still experiencing property price growth, so let’s take our monthly whip around Australia and examine the latest charts from Corelogic. Their latest results take the annual decline across the national index to 3.5%, with their hedonic home value index reporting a 0.5% fall in dwelling values nationally in October. 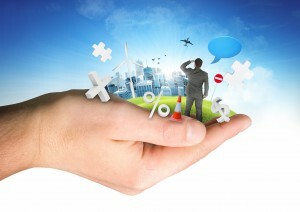 Higher value housing markets continue to lead the market downturn. 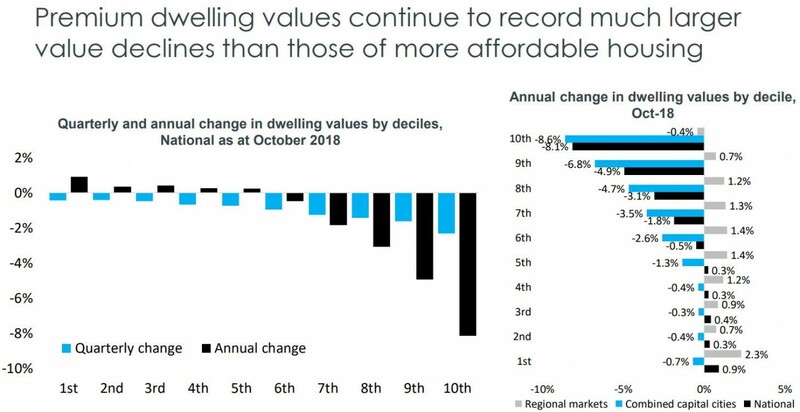 Nationally, the highest value quarter of the market has led the downturn, with values falling 6.6% across this segment over the past year while lower quartile values have recorded a 0.5% rise in values. In the Melbourne’s property market, the top 25% of the market by value has seen values fall by almost 9% over the past year; while in Sydney’s the upper quartile of the market values were down by 8.6%. 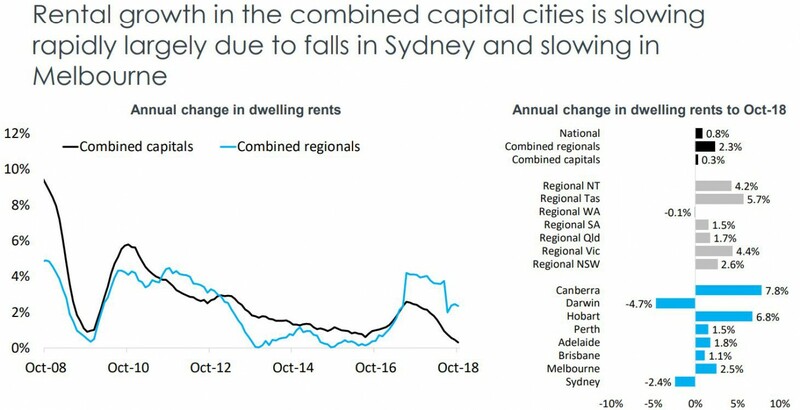 The Sydney property market peaked in mid 2017 and Sydney real estate values have been falling consistently since then, now recording its weakest conditions since 1990 – which was the last time the annual decline in dwelling values was at least 7.4%. Interestingly there has been a larger decline in the value of houses in Sydney (- 7.4%) than in the Sydney apartments, however unit values were down slightly more than house values last month which may be a sign of the first cracks appearing in the apartment market as a record number of new units move from construction into the settlement phase. But remember all this is in the context of median dwelling prices having increased by 51.0% in Sydney over the last 5 years. Obviously some segments of the Sydney property market are likely to fall considerably more than that average (we’re looking at you off the plan properties), while some segments of the market are holding their own. 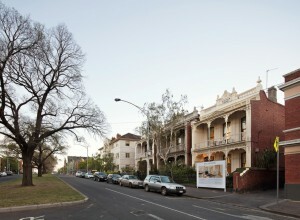 First home buyers are active in Sydney creating stronger markets over the lower quarter of the market. 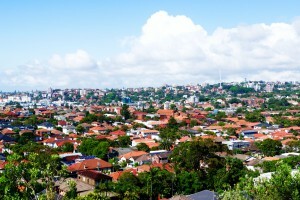 Strong economic growth and jobs creation is leading to population growth and ongoing demand for property in Sydney. At the same time international interest from tourists and migrants continues. Sydney is currently offering investors an opportunity to buy established apartments in the eastern suburbs, lower north shore and inner west in a “buyer’s market” with little further downside and the prospect of the market moving forward again in late 2019. The Melbourne property market peaked in November 2017 and is experiencing a soft landing after 5 years of strong price growth. 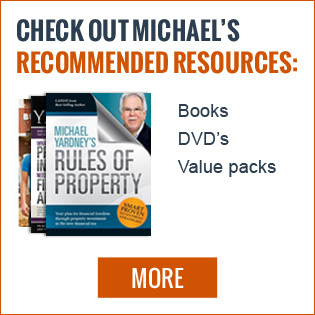 Property values are now 4.9 % below their peak. 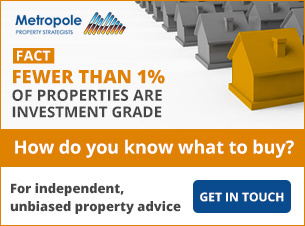 Corelogic reports that Melbourne’s housing market was the weakest performing capital city over the past three months, with dwelling values falling 2.1% over the last quarter with the upper quarter of Melbourne’s housing market (properties valued over $920,000) feeling the brunt of the downturn. However, over the past five years, median property prices in Melbourne have increased by 41.5% and over the past decade they are 77.3% higher. While Melbourne’s property prices are likely to fall by a little further, there is no crash in sight. Property values will be underpinned by a robust economy, jobs growth Australia’s strongest population growth and the influx of 35% of all overseas migrants. Property price growth in Brisbane has been slow over the past few years, however all indicators suggest the Brisbane property market has the potential for significant growth over the next 3 years, with Queensland leading the nation in net interstate migration over the past year. While overall dwelling values unchanged over the last month, some segments of the Brisbane property market are outperforming – particularly homes within 5-7km of the CBD. 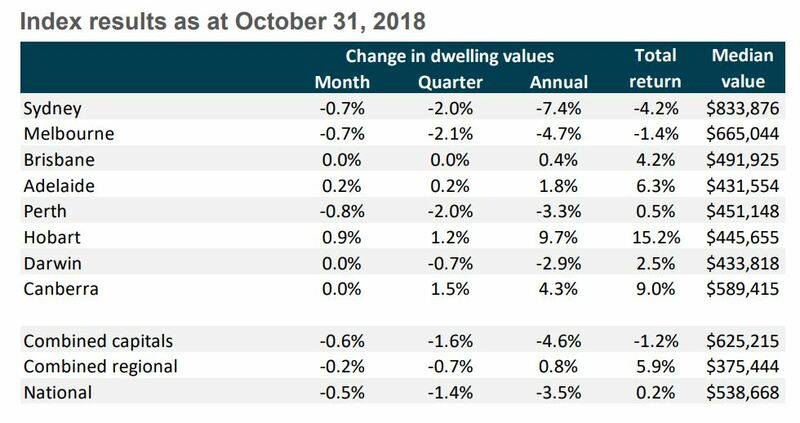 There is still an oversupply of Brisbane apartments and values remain 11.2% below their previous record high recorded back in 2010, however with high supply levels moving back towards balance and rising demand we may start to see this sector showing a consistent improvement. One of the positive signs emerging is Queensland’s strong job creation, in part due to all the infrastructure development that is occurring. There is a combination of large-scale development to Brisbane’s major employment hubs and many smaller scale developments which will further enhance the liveability of the City. 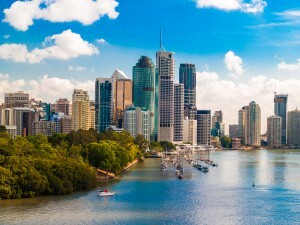 These projects will significantly boost Brisbane’s employment growth and the languishing economy and demand for property is likely to soar around these inner-city locations. 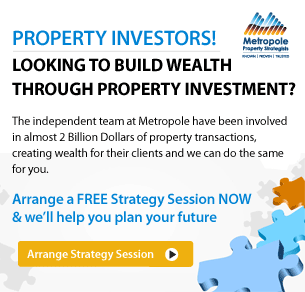 Our Metropole Brisbane team has noticed a significant increase in local consumer confidence with many more homebuyers and investors showing interest in property. At the same time we are getting more enquiries from interstate investors there we have for many, many years. 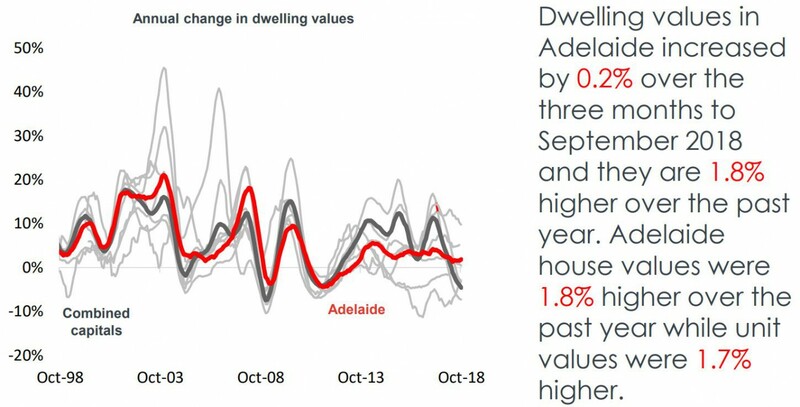 In Adelaide over the past few years there has been consistent moderate house price growth – house values were 1.8% higher over the year and apartments grew in value by 1.7% . This has been underpinned by low interest rates and relatively positive affordability compared to other capital cities, despite Adelaide’s difficult economic conditions. 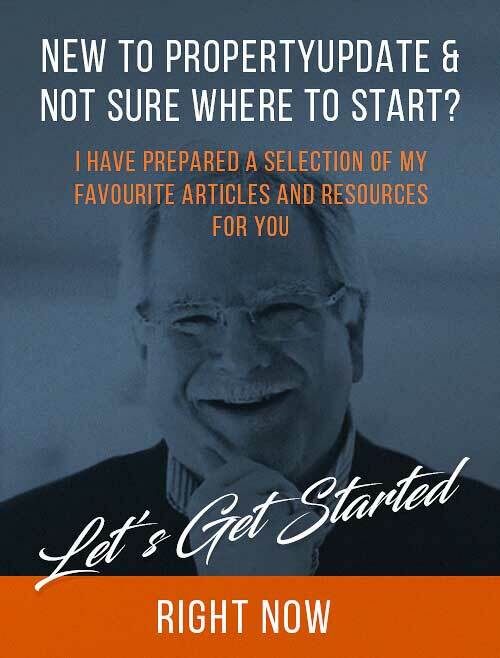 Currently interstate investors are looking at Adelaide as a future ” hotspot”, but I would caution that there are a few long-term growth drivers in Adelaide. Currently Adelaide which is experiencing above average unemployment rates and poor employment growth. Like many other capital cities Adelaide is experiencing an oversupply in the unit sector and softer demand for this type of dwelling will restrain price apartment price growth. While Adelaide might be a lovely city to live in and is still very affordable, our research suggests investors should look elsewhere. 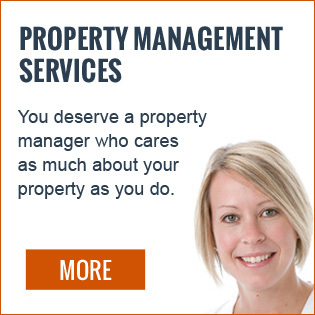 For example, there are better long-term growth drivers in the Brisbane property market. The Perth property market has been on a downward trajectory since peaking in June 2014. 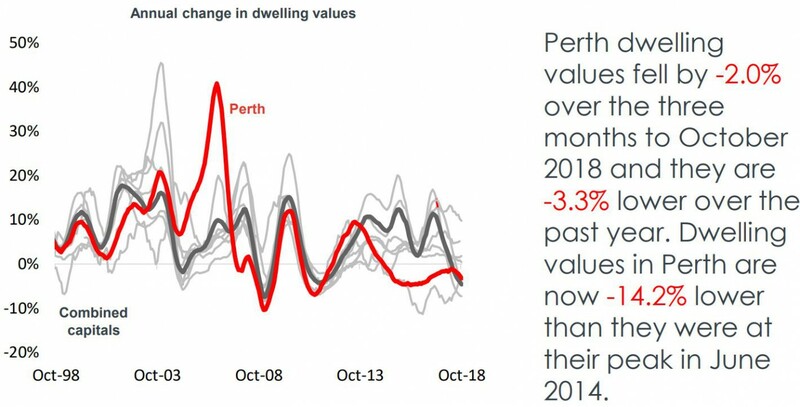 Although values are still falling, many of the other metrics are now suggesting that the Perth property market is bottoming out, though it has not found a floor yet. Recently QBE released its Australian Property Market Outlook – 2018-2021 and they suggest that a further 2% decline in the median house price is forecast over 2018/19, before modest price growth begins to re-emerge in 2019/20 and 2020/21. Although the outlook for the state economy has become more positive, the dwelling surplus in Perth looks set to remain in place for some time, and it appears that the market is beginning to retreat again. While the Perth market may level out in the next year, it’s much too early for a countercyclical investment in the west – I can’t see prices rising significantly for a number of years. Due to the reluctant demand from investors and the significant oversupply of new apartments there is little to no prospect of capital growth or rental growth in the Perth apartment market for many years. Like the other states, Western Australia’s population trend has a significant impact on the overall performance of its property market. To get people back into the State more jobs will need to be created. Hobart has been the strongest performing capital city over the last 3 years, but indicators are suggesting that this market has now topped out. Given the relatively strong rental market, alongside the recovery in the Tasmanian economy and continued population growth, house prices are expected to continue growing in the short term but then as many new apartment projects under construction are completed, price growth is likely to slow down. Over the last five years median dwelling prices have increased at about double the rate of household income growth creating a deterioration in housing affordability in the Apple Isle. 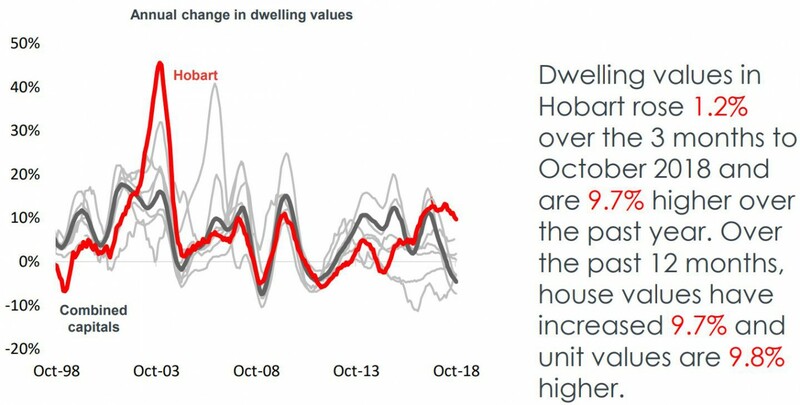 This together with investors moving their aim to the next “hot spot” are further reasons that Hobart’s property prices growth phase is near its peak. 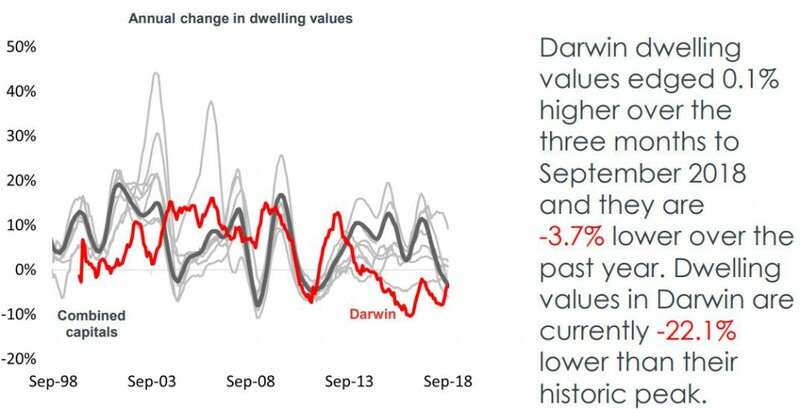 The Darwin property market peaked in August 2010 is still suffering from the effects of the end of our mining boom today 8 years later falling another 3.7% over the last year, and our research suggests that house prices are likely to keep falling for some time yet. 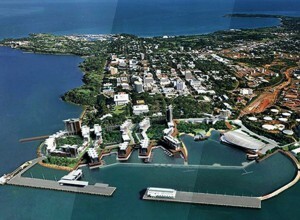 Darwin is Australia’s most affordable capital city housing markets due to its high wages at a time of continuing house price and rental falls. As opposed to the east coast capital cities where many jobs are being created, Darwin had a net loss of jobs last year, showing how its economy is languishing. Economic growth in the A.C.T is projected to begin to slow in the 2019 financial year, yet remain above the national average. With public sector employment accounting for more than 40% of jobs in the Australian Capital Territory, if history repeats itself the uncertain political climate leading up to the federal election next year will reduce local consumer confidence and dampen housing demand a little but, as always, this will correct itself after the election and Canberra’s property market is likely to continue to perform well in the medium term. Our rental markets remain reasonably subdued, with capital city rental growth a mere 0.8% over the last year. On the other hand regional rental markets have seen weekly rents rise 2.7% over the year. 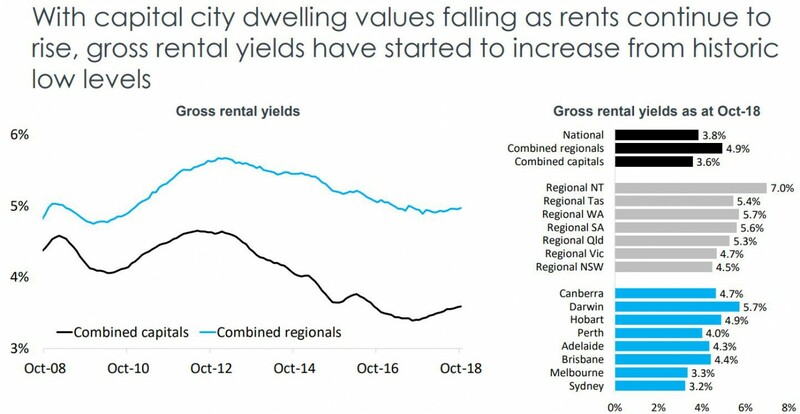 Of course as rental growth outpaced capital growth rental yields have continued to lift from their record lows, however yields generally remain well below their decade average of 4.31%. Our quieter markets have translated into fewer property sales with transaction volumes 10% lower than they were a year ago. Vendor metrics have generally softened, with the number of days it takes to sell a property and the amount vendors need to discount their initial asking price trending higher. And of course auction clearance rates are at the lowest level they have been for a long time. These factors have weakened vendor confidence, leading to fewer new properties for sale being added to the market, but the total advertised stock levels are tracking higher due to a slower rate of absorption. The trend in population growth has eased over the twelve months ending March 2018, as both the rate of net overseas migration and the rate of natural increase fell. Of course slower population growth has a negative implication for housing demand. 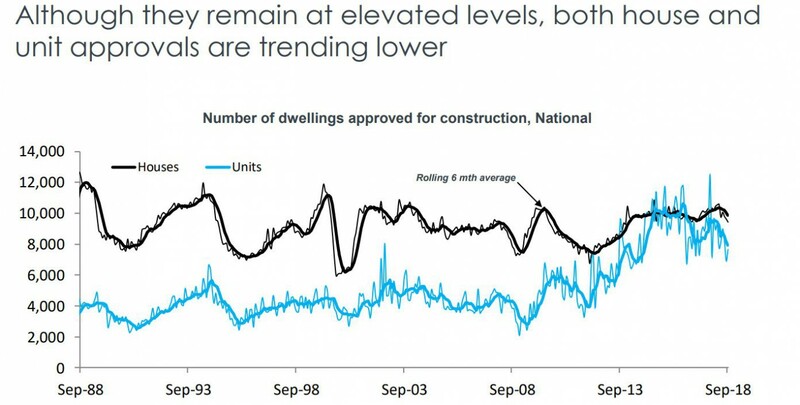 The oversupply of housing stock will gradually get taken up as developers are now slowing down their activity and dwelling approvals for new construction is down 13.6% over the twelve months to August 2018, with approvals for attached dwellings (apartments) falling almost 24% while house approvals fell 4.4%. 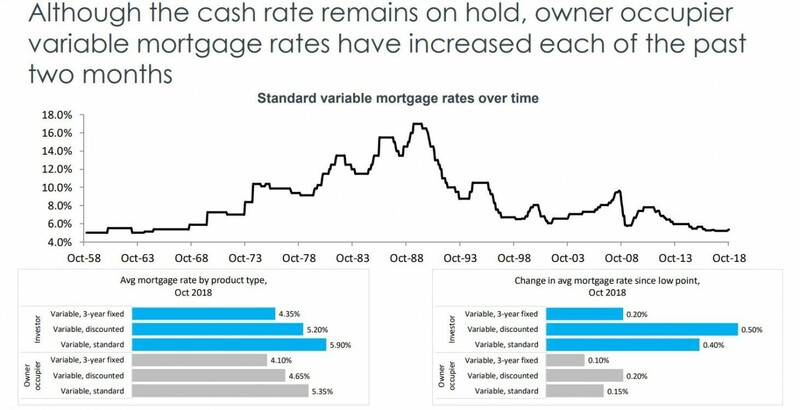 While official interest rates remain at 1.5%, the variable mortgage rates edged 0.5% higher in September, reflecting an out of cycle rise from some lenders over the month. Housing finance data and credit aggregates highlight the slowdown in investment lending, while owner occupier lending has slowed but remains relatively healthy, rising 7.6% over the 12 months to July 2018. 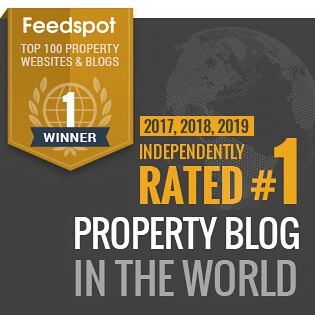 We’re clearly in the next stage of the property cycle, one of moderate growth in some regions and virtually no growth in others and falling prices in yet others. 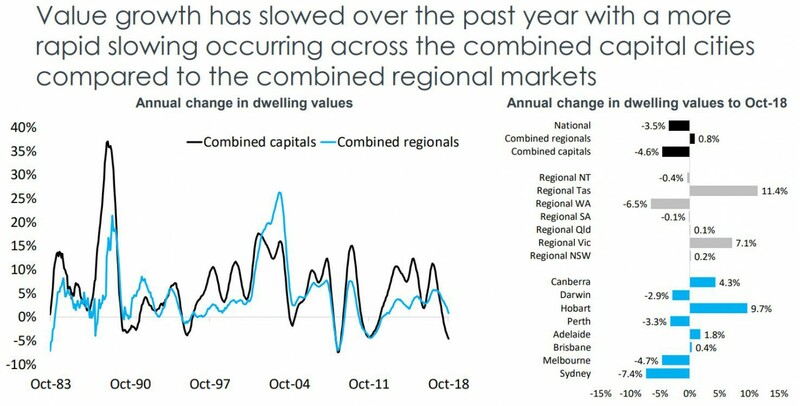 Australia’s property markets are very fragmented, driven by local factors including jobs growth, population growth, consumer confidence and supply and demand. Similarly suburbs undergoing gentrification are likely to outperform.